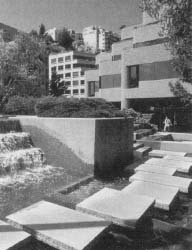 Levi Plaza Office Park, San Francisco, California. Thanks to the popularity of its blue jeans, Levi Strauss & Company became the world's largest manufacturer of brand-name apparel. The company branched out and sold other clothes, but blue jeans remained its most famous product, and Levi's is still one of the most recognized brands in the world. Levi Strauss & Company is also hailed for its commitment to social causes and fair treatment of its workers. In 1848, gold was discovered just outside Sacramento, California, which unleashed the first "gold rush." Tens of thousands of people from around the world descended on northern California, hoping to make a fortune mining gold. San Francisco turned into the commercial heart of the region, and its population grew from a few hundred to seventy thousand in just a few years. In 1853, Levi Strauss, like thousands of others, moved to the boom town of San Francisco. He planned to make his money in dry goods, selling cloth, sewing materials, and ready-made clothes. Strauss set up his first shop near the waterfront and formed a partnership with his brother-in-law, David Stern, who was married to his sister Fanny. The enterprise was officially named Levi Strauss & Company in 1863. By then, the company sold a wider range of items, including blankets and women's clothes. Customers could also shop from a catalog. One product Strauss sold was work pants made out of canvas. He hired tailors to make the pants for him in their homes. Later, he switched to denim as the fabric for these pants. This type of cotton cloth was known for its strength and was often dyed blue. With the success of its pants and other products, the company opened a new headquarters on Battery Street in 1866. In 1872, a Nevada tailor named Jacob Davis asked Strauss to join him in a business venture. He had added metal rivets to the pockets of denim pants, making them less likely to rip at the seams. Seeing the value of the rivets, Strauss agreed to work with Davis. The next year, Strauss's company sold its first blue denim pants with rivets, the original Levi's blue jeans. The pants also featured two rows of V-shaped orange stitching on the back pockets, so customers could easily pick out Strauss's jeans. That "V" is still used on Levi's. As sales grew, Levi Strauss & Company opened its first factories. At the time, many San Franciscans were upset that local companies were hiring Chinese immigrants, who would accept lower wages than American workers. Wanting to avoid any trouble with customers, Strauss hired American women to work in his factories. He had to pay higher wages than the companies that used Chinese workers, so Levi pants cost more. To make up for the higher price, the company offered a higher-quality product. The company began promising that the pants would not rip, offering a new pair if they ever did. The blue jeans were popular with miners and ranchers, and sales of Levi Strauss's other dry goods also rose. In 1890, Levi Strauss & Company became a corporation, issuing shares of the company to employees and members of the Strauss and Stern families. Strauss's nephews, the sons of Fanny and David Stern, now ran most of the company's business. They took complete control in 1902, after Strauss's death. Levi Strauss begins selling dry goods in San Francisco, California. Levi Strauss & Company sells its first pair of riveted blue jeans. Koveralls, a denim playsuit for children, is the first company product sold nationally. Levi Strauss & Company introduces its first ladies' blue jeans. Zippers appear on Levi's jeans for the first time. Company sales reach $1 billion. Robert Grohman becomes the first CEO of Levi Strauss Sc Company with no relation to the company's founder. After selling shares to the public for fourteen years, Levi Strauss once again becomes a private company. Levi Strauss & Company introduces Dockers, a line of casual clothes. Company officials pay more than $46,000 for a pair of Levi's more than one hundred years old. In 1906, a huge earthquake and the fires that followed it destroyed large parts of San Francisco. The earthquake dealt a blow to Levi Strauss & Company, as it lost its headquarters and factories. The company quickly rebuilt, and in 1912 it introduced its first significant new product: Koveralls, denim playsuits for children. The Koveralls became the first company product sold across the United States. 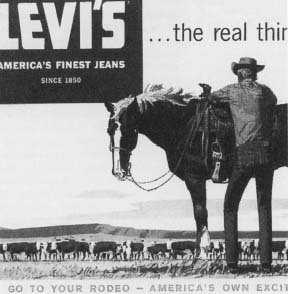 At the time, Levi's jeans were sold only in the West. Despite the success of Koveralls, however, company profits started to fall after World War 1 (1914-18). In 1921, company president Sigmund Stern gave his son-in-law, Walter Haas, more responsibility at Levi Strauss. Haas made changes in the company's accounting and pricing practices and modernized the manufacturing process to try to improve finances. By 1928, Haas was running the entire company, and profits were up from their earlier lows. As other U.S. companies did, Levi Strauss struggled to remain profitable during the Great Depression of the 1930s. Sales were finally boosted by a growing interest in the West and the lifestyle of cowboys. "Dude ranches" became popular, offering Easterners a vacation that featured horseback riding and living like a ranch hand. The tourists saw cowboys wearing Levi's. Western movies also showed cowboys wearing blue jeans, stirring more interest in the pants. Levi Strauss took advantage of this growing fascination with the West and began featuring cowboys in its ads. The cowboys had an image of being strong and independent. Wearing Levi's jeans, the company suggested, gave customers those qualities. Wearing Levi's blue jeans also became a popular fad among some West Coast college students. Denim was similar to jean, another nineteenth-century cloth sometimes used to make work pants and other clothes. Over time, customers began referring to Levi Strauss's denim pants as "jeans" or "blue jeans." By 1960, Levi Strauss & Company also adopted the name. The company's pants, however, were in short supply after 1941, when the United States entered World War II (1939-45). The U.S. government wanted denim work clothes for employees in the defense industry, and the Navy provided sailors with Levi Strauss's denim as well. When the war ended, Levi Strauss found a new market for its blue jeans. Veterans going to college for the first time boosted their popularity on campuses across the country, showing that the pants were casual clothes suited for any environment. The original market for Levi jeans were workers who needed a durable material that could stand up to their rigorous jobs. Reproduced by permission of The Advertising Archive. In 1950, the company ended its general dry-goods business to focus on making its own denim clothes. During the "baby boom" years after World War II, when returning soldiers began raising families, Levi Strauss's advertising focused on young people. Up-and-coming movie stars of the 1950s, including Marlon Brando (1924-) and James Dean (1931-1955), made wearing Levi's "cool." The characters they portrayed in films often defied the law or adults, and blue jeans became a symbol of rebellion against authority. By the 1960s, when many young people protested racial inequality and the Vietnam War (1959-75), blue jeans were part of the "uniform" of American youth. 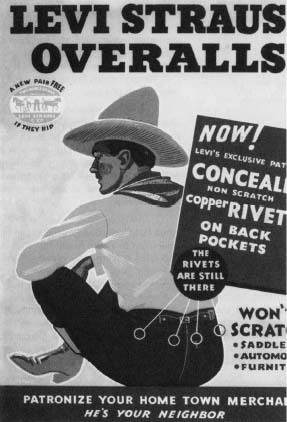 The power of U.S. media, especially television and film, then helped spread Levi's popularity around the world. In 1958, Walter Haas Jr. took control of Levi Strauss & Company. During his presidency the company introduced new products designed to appeal to the youth market. White jeans and pre-shrunk blue jeans appeared in 1960. Corduroy pants first appeared in 1963, and in 1968 the company launched a complete line of women's clothing (its first blue jeans for women had appeared in 1935). Levi's bell-bottom jeans hit the market in 1969. The basic Levi's blue jeans, however, remained the most popular item in the company's line. In 1971, Levi Strauss sold shares to the public for the first time. It licensed the Levi's name to other clothing companies, which put the brand on such items as shoes and socks. The demand for blue jeans was so strong the company sometimes faced a shortage of denim. In 1973, however, profits fell because of some poor decisions made in the company's European division. Customers wanted bell-bottoms, but Strauss had made straight-legged pants for the market. But even with this setback, company sales reached $1 billion in 1974. By 1977, Levi Strauss was the world's largest clothing manufacturer. Two years later, it grew again with its purchase of Koracorp, which made men's and women's sportswear. The company, however, began to face challenges in the blue jeans market, as well-known clothing designers such as Calvin Klein (1942-) began selling jeans with their names on the label. These "designer jeans" ate into Strauss's sales, and by the early 1980s profits were falling. In 1981, Robert Grohman took over as chief executive officer (CEO), marking the first time the company was led by someone without ties to the Strauss family. Grohman could not turn the company around, and Robert Haas, son of Walter Haas Jr., took control in 1984. The Levi Strauss & Company's reputation for treating employees well began after the 1906 San Francisco earthquake. The company continued to pay all its workers as it rebuilt its factory and offices. Later, during the Great Depression (1929-34), the company kept workers busy putting in new floors in one of its factories, rather than fire them during difficult times. Levi Strauss has also taken the lead on many social issues. During the 1940s, it desegregated its factories, bringing white and African American workers together before many other industries took this step. During the early 1980s, Levi Strauss became involved in educating Americans about AIDS. The company was also one of the first to offer health benefits to workers' partners as well as to husbands or wives. Later, it led the effort to ensure that the international partners of U.S. clothing companies treated their workers fairly. The rivets that were used to keep the jeans together were one of the marks of Levi Strauss quality. They were later blunted to make sure they wouldn't scratch things such as horse saddles and wooden furniture. members and a few executives bought all of Levi Strauss & Company's shares. Haas also sold off some of the companies Levi Strauss had bought during its growth years. In 1986, the company introduced a new line of casual pants, Dockers, that sold well, and international sales of blue jeans remained strong. But overall profits slumped again in the early 1990s, as the company failed to adapt to fashion trends. "Hip hop" styles, made popular by many rap singers, featured baggy pants with wide legs and deep pockets. Levi Strauss, however, continued to market its traditional styles of blue jeans. The company also lost ground to major retailers, such as J. C. Penney, which began selling their own brands of jeans. Haas continued to make changes in the company's structure and its product line. In 1996, he and a few senior managers bought out stock owned by some Haas family members and employees. That same year, Levi Strauss introduced a line of dress clothes, Slates. During the 1930s, Levi Strauss made some changes to its pants. The rivets on the rear pocket were covered so they wouldn't scratch saddles or chairs. The company also put a small red tag with "Levi's" on the right rear pocket, so customers could easily identify the brand. In 2001, the company paid more than $46,000 for a pair of Levi's that sold for about $1 when they were made more than one hundred years before. The company had already launched its Vintage line, featuring reproductions of pants the company sold in the past. Another change came in 1999, when Haas turned over the company's leadership to Philip Marineau. Strauss also tried stirring sales among teens, especially girls. In 2001, ads for Levi's Superlow jeans featured singing belly buttons, created with computer animation. Another ad campaign used the slogan "Make Them Your Own," trying to remind customers that Levi's were for people who wanted to assert their independence and unique personality. Company officials remained confident that Levi's would endure as one of the world's great brand names. Are Levi jeans for men manufacture with inseams of 28 inches or less? If so, where and how may they be obtained? If not, why not? Your response would bve appreciated. Thanks!